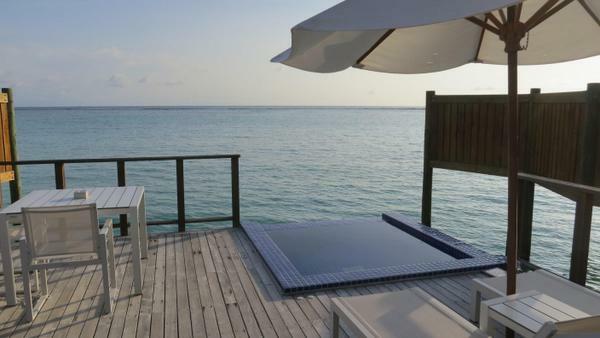 You Can Use Your Hilton Points Towards an Overwater Bungalow in the Maldives! 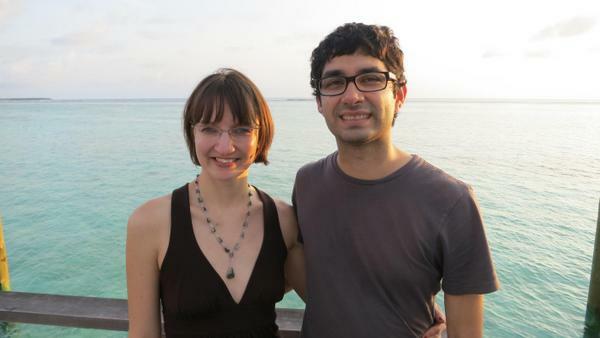 Traveling to the Maldives is also very expensive, but you can do it for much less than the retail cost! This trip would have cost us ~$27,000, but we only paid ~$5,000!! 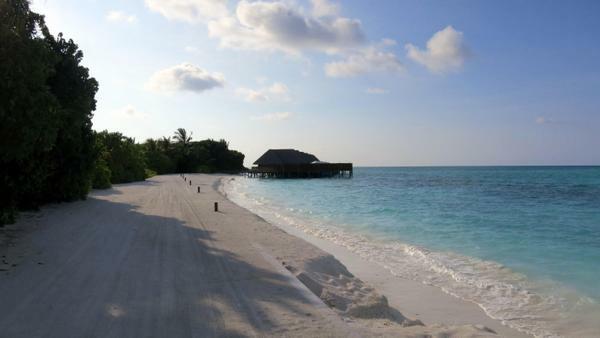 These series of posts will show you how you can also take a trip to the Maldives on miles and points! 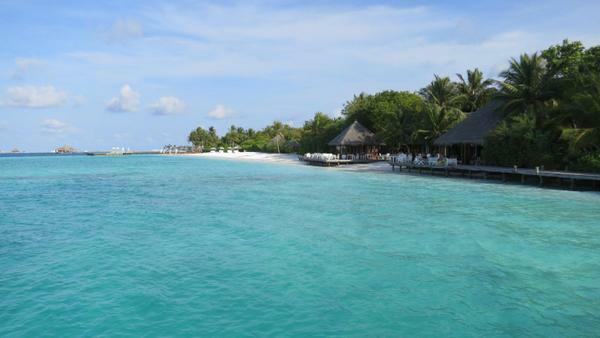 We chose the Conrad Rangali Island hotel because we have a lot of Hilton points. And with our Hilton Diamond status we got free breakfast everyday, which is a big money saver! 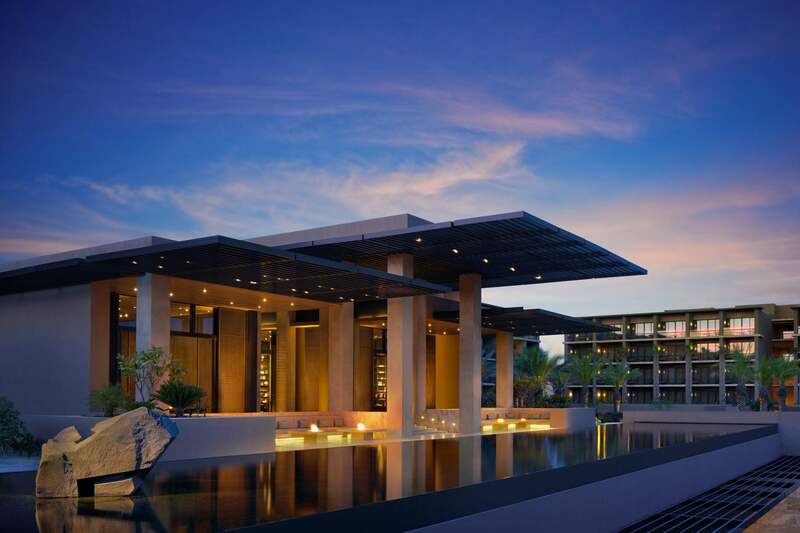 There is also the Park Hyatt Maldives Hadahaa which could also make a very good redemption at 25,000 Hyatt points per night. 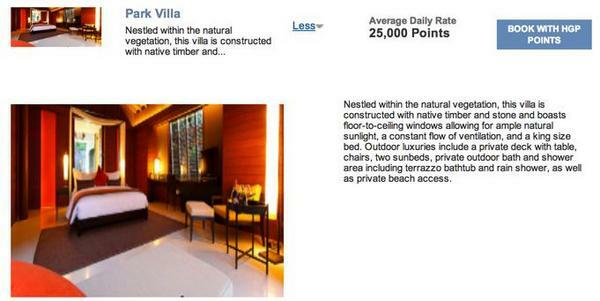 We used 39,000 Hilton points per night because we booked before the devaluation. 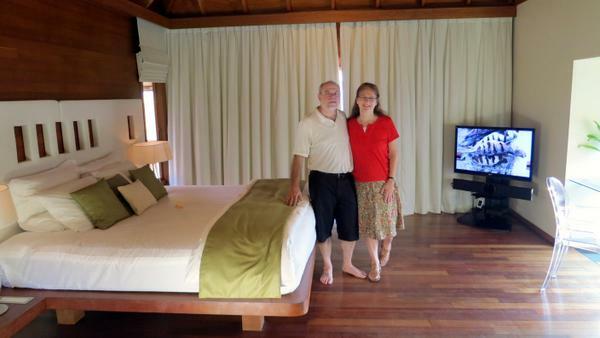 It was $375 per night to upgrade to an overwater bungalow. 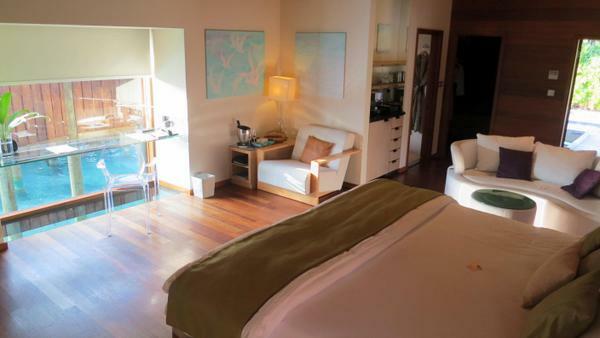 I reviewed the King Villa Suite, which also cost 39,000 Hilton points, but we didn’t have to pay the extra $375 per night to upgrade. 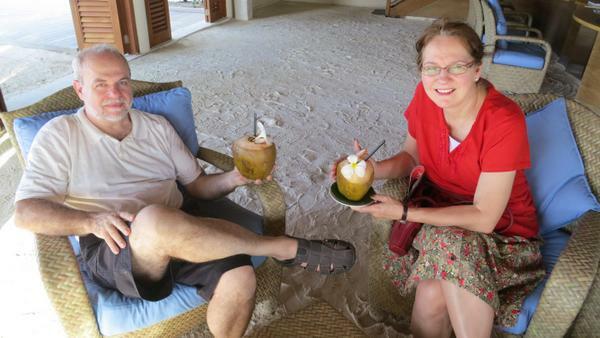 In today’s post, we will share our experience with the overwater bungalow, where our parents stayed. 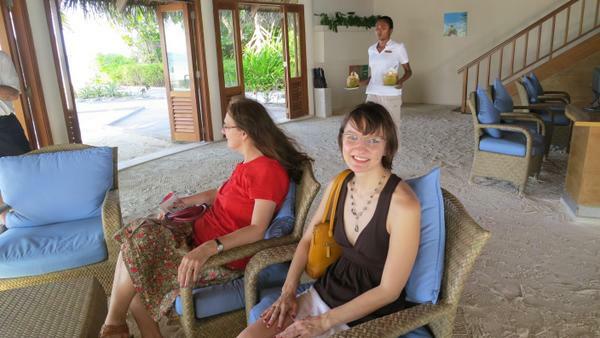 When we arrived at the hotel by the seaplane, the staff excitedly greeted us and checked us in. 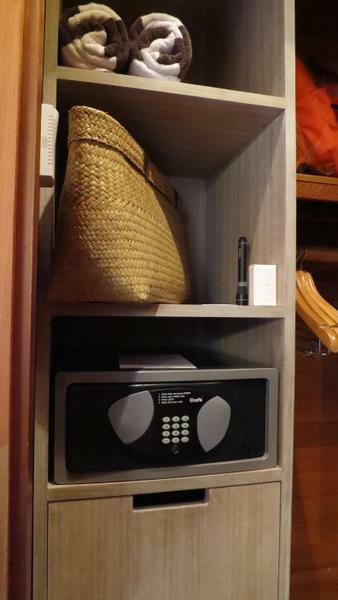 Because we had booked 3 rooms, they were careful to ensure the correct baggage was sent the right rooms. We took a boat to the island where our parents were staying. 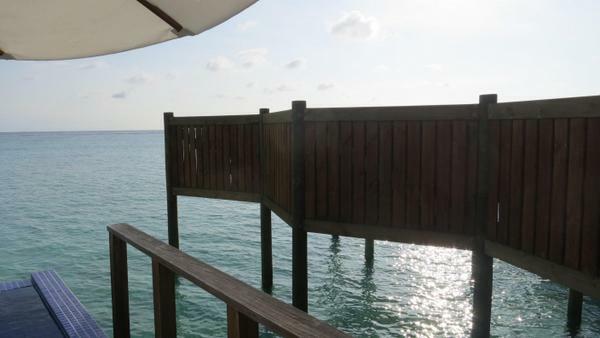 The Conrad is comprised of 2 separate islands, which adds privacy to the resort. The water looked so blue and inviting. 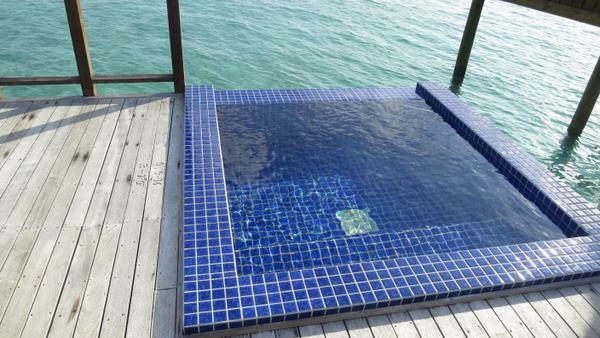 I could hardly wait to go for a swim! We sat down in the reception area while the employee checked us in. 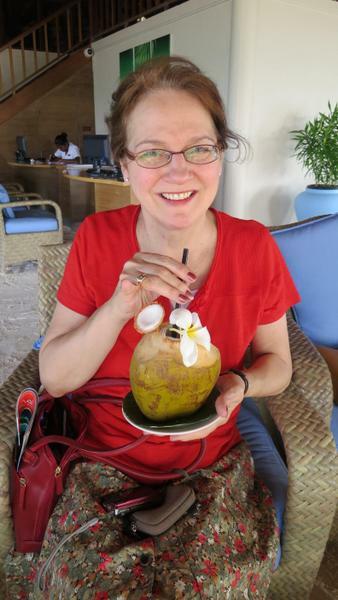 We were each given fresh coconut water that was very sweet and refreshing. My mom and Mark were really enjoying themselves. We were all so excited for our stay! 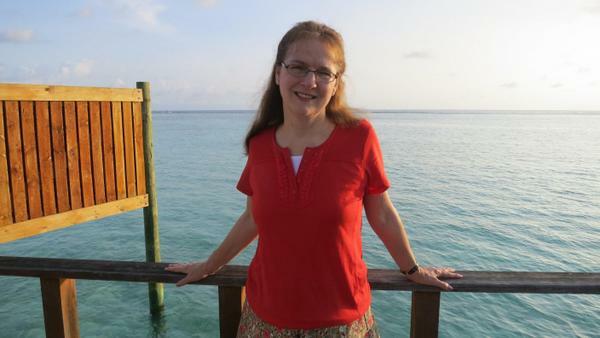 My mom grew up on welfare with 7 other kids, and worked hard to provide for me growing up. 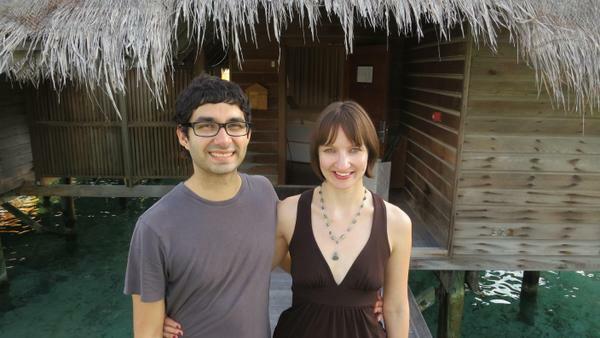 This trip was a way for me to give back to her for all she’s done for me. After a few minutes, the staff member escorted us to our parents’ rooms. It was another ~5 to 10 minute walk from reception. It was a beautiful walk to our rooms. Soon, we had reached a small row of bungalows. 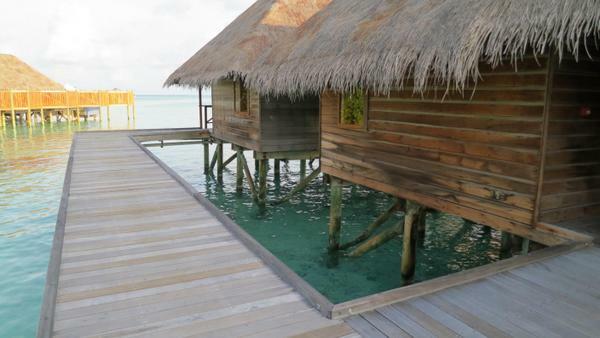 The overwater bungalows or King Water Villas go for ~$3,000 per night (depending upon your travel dates). However, we used our Hilton points, so it cost us “only” $375 per night for a guaranteed upgrade, which is still quite a splurge for us, but our parents are worth it! After checking in, we were escorted to our rooms. 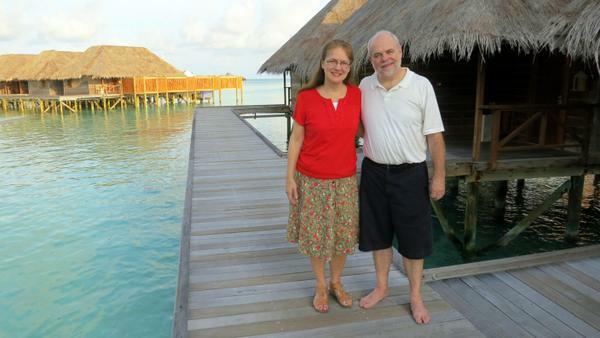 The wooden bungalows were built on stilts over the water. It was very peaceful and quiet. My Parents Were Excited to See the Inside! My mom and Mark were so happy! Our parents stayed in rooms 321 and 322. The rooms were very spacious, open, and airy. 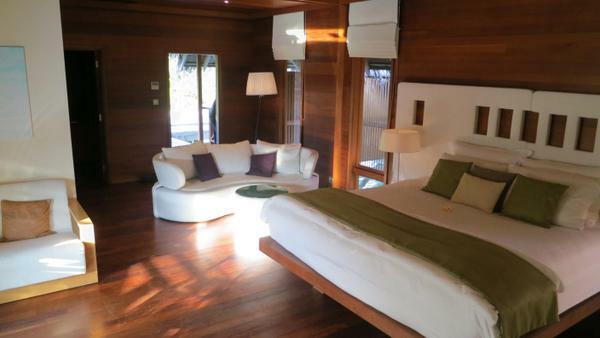 There was 1 main bedroom and living area with a bed, desk, and couch. I liked that there were several places in which to sit and relax. 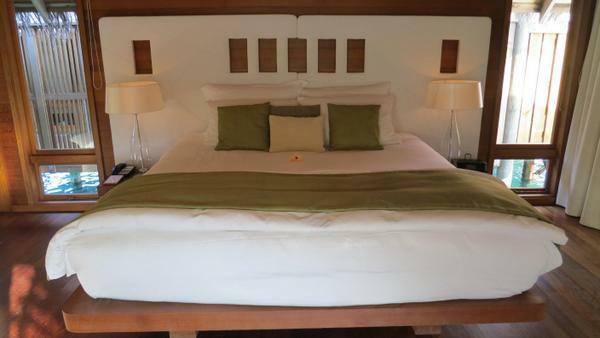 The king size bed was accented with green pillows and a throw blanket. After All That Traveling, I Could Have Easily Taken an Afternoon Nap! On the opposite side of the room was the desk. There was a glass bottom floor and large windows that let in lots of natural light. 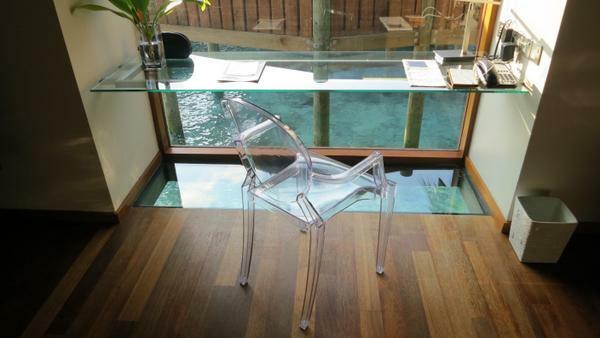 A Desk That Looks Like It’s Floating on Water!? That’s Quite a Change From the Desk at Home That Looks Like It’s Floating on a Carpet! Near the desk, was another chair. 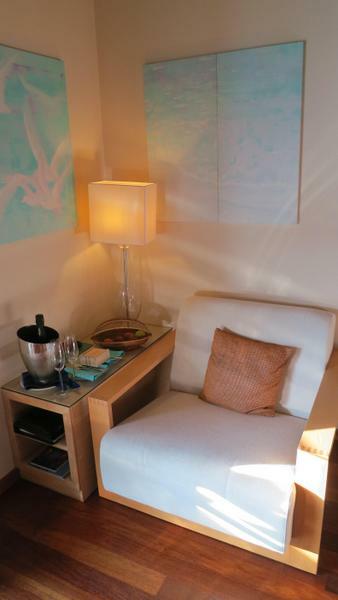 It was a cozy little nook to relax and read a book or enjoy a glass of wine. 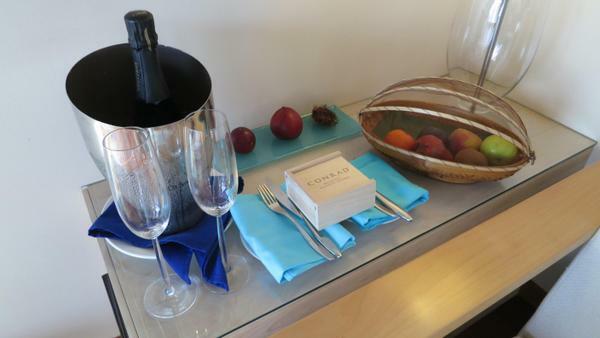 They received a bottle of champagne, fresh fruits, and chocolate. 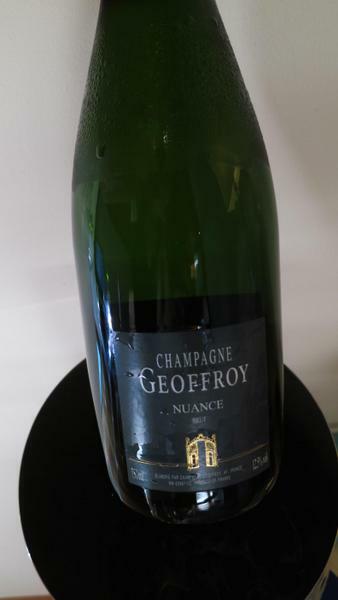 The champagne was Geoffroy Nuance. And the chocolates looked delicious! And the Decadent Chocolates Were a Nice Touch! The couch was large enough for 3 people. 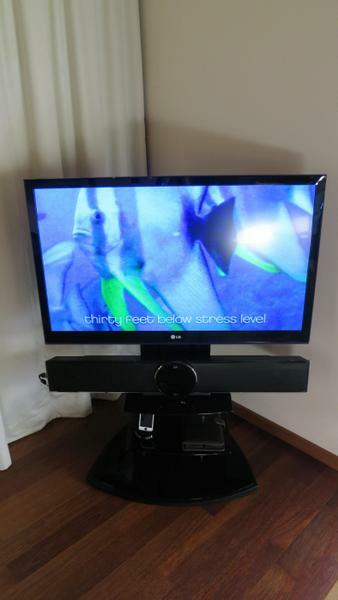 There was a flat screen TV, which we used before we left to play a slideshow of the pictures and video we had taken during the trip. Connecting our laptops and video cameras was very easy! 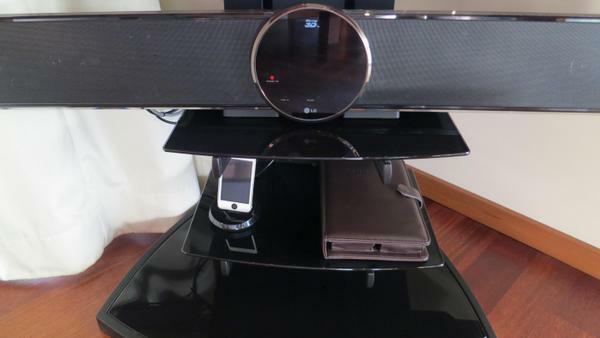 There were also iPods in every room. I liked that there was some romantic music to set the mood. 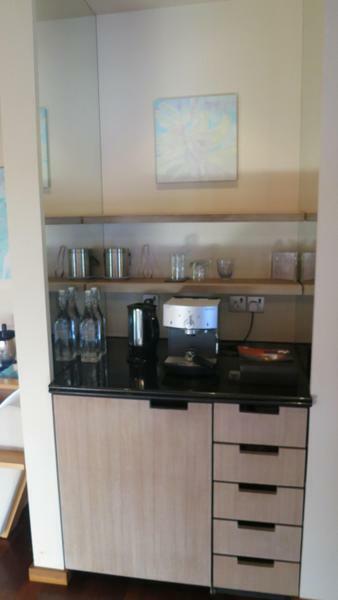 There was a minibar with a fridge and coffeemaker. 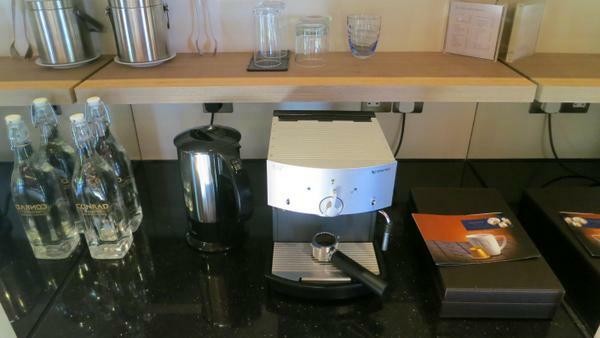 There was complimentary bottled water and a Nespresso machine. The closet was large enough to store all of our luggage. But it would have been nice to have more light for packing and unpacking. 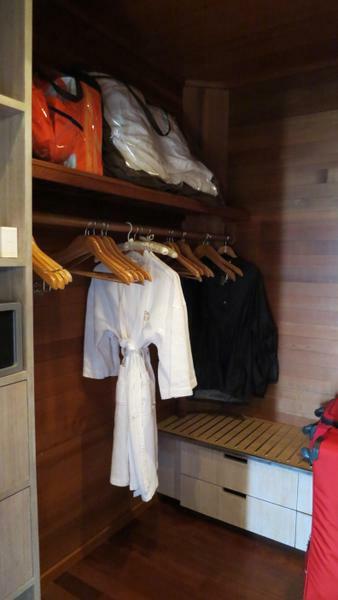 The closet had a safe, beach towels, and a beach bag for trips to the water! 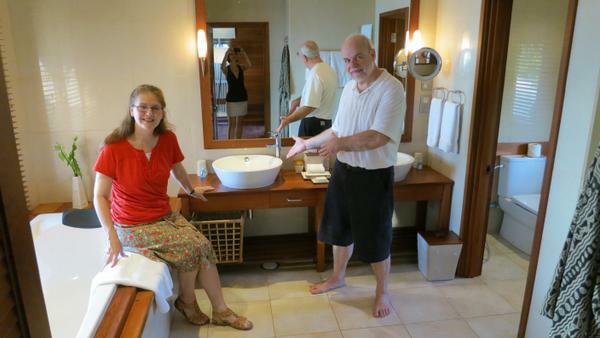 There was a big bathroom with a walk-in shower, bathtub, and double sinks. 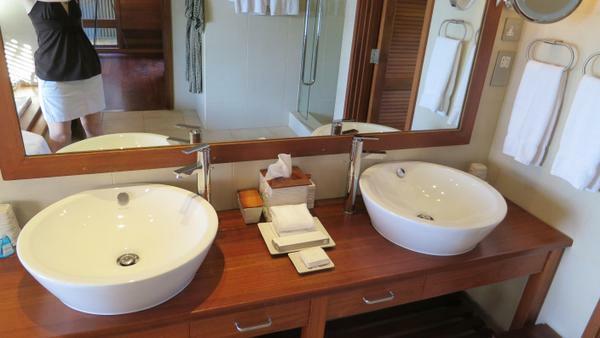 There were double sinks with various amenities. Two Sinks Cut the Time It Takes to Get Ready in Half (in Theory)! 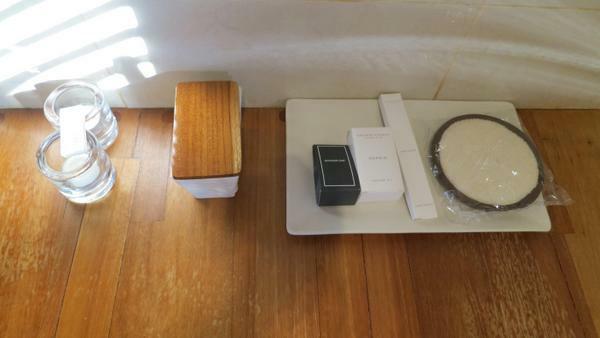 Toothbrushes and soap were left out for us. The bathroom was very luxurious. 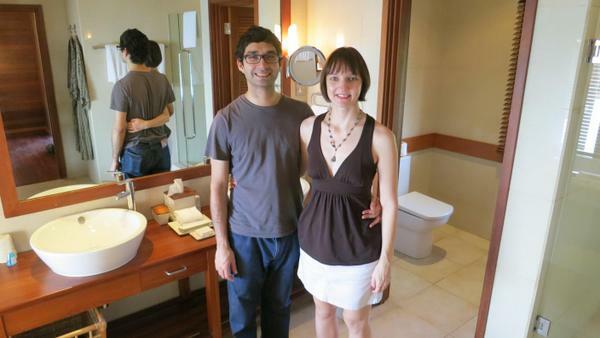 Hey, Any Couple Can Pose Together on a Sun-Kissed Beach…We Pose Romantically in the Bathroom! 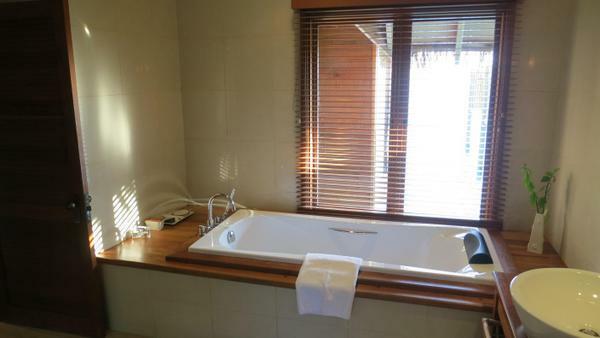 The window above the bath tub had a gorgeous view of the lagoon. 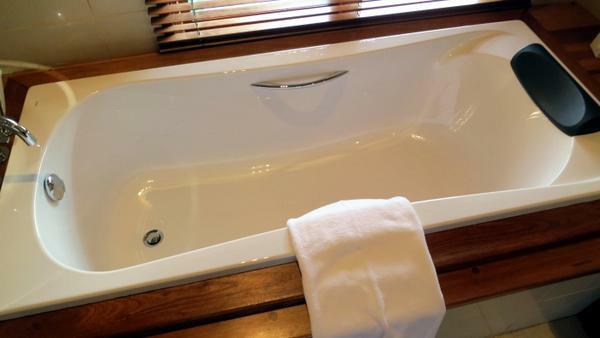 The bath tub looked comfortable, but was not a jetted tub. It was also on the small side, and it would be difficult to fit 2 people. 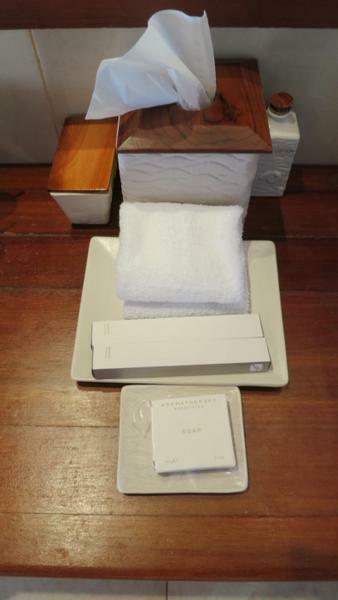 Included in the amenities were candles and matches. 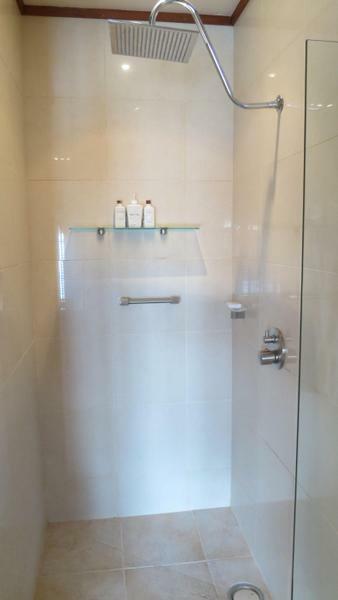 There was also a walk-in shower, but it was on the small side for rooms that cost ~$3,000 per night. 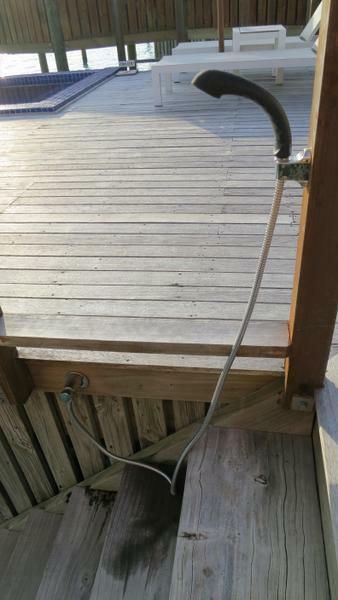 The shower head was a rain shower. The Only Place It Rained the Entire Trip! The best part of the room, however, was the view from their patio. The calm blue water seemed to go on forever. 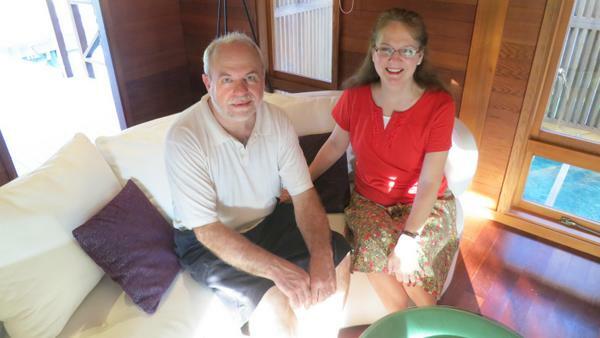 The patio had lounge chairs, a dining table and chairs, and even a jacuzzi! Which Should We Try Out First? 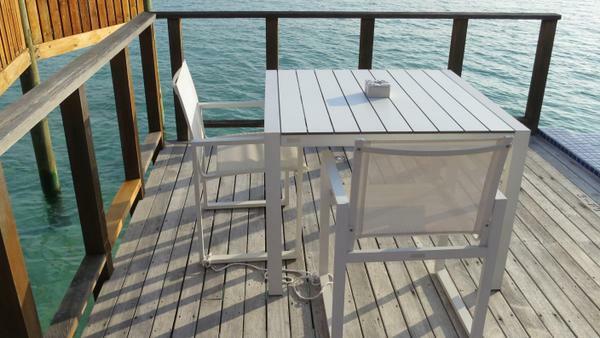 The table and chairs would have been a great place to enjoy some champagne and strawberries while watching the sunset. I was really impressed with their room. Do Hotel Rooms Get Any Better Than This?! The Jacuzzi was large enough for 2 people. 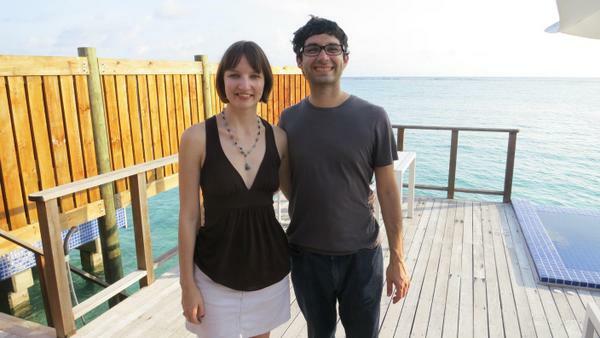 Their neighbors were separated by a wooden privacy fence on either side of them. You could not see your neighbors, but you could hear them if they were also out on their patio. 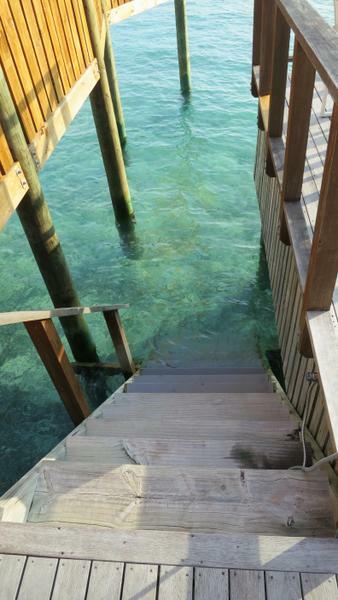 I also enjoyed having a private entrance into the lagoon. 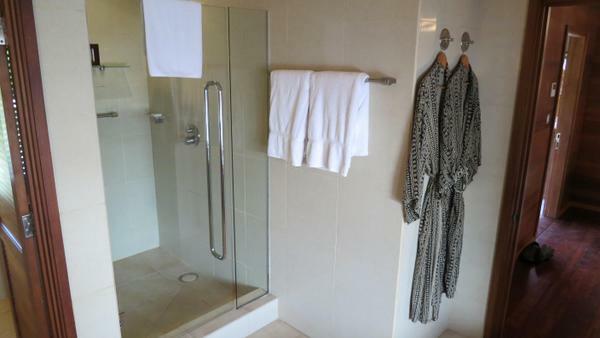 There was even a shower for rinsing off after a swim in the lagoon! 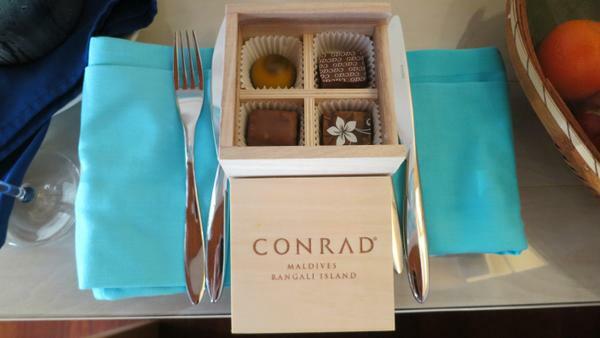 We loved the Conrad Maldives and are already planning our return trip! 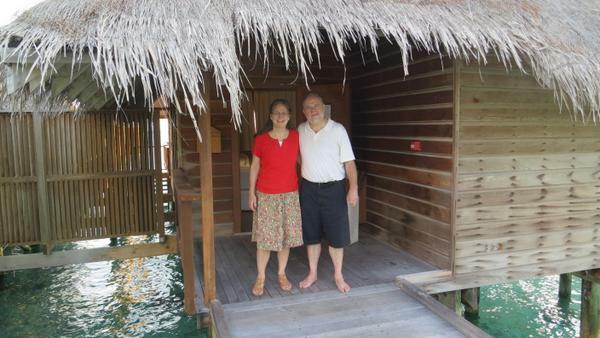 Booking the bungalow was a nice treat for our parents, but Daraius and I were extremely happy with our beach side villa (which required no extra cash). 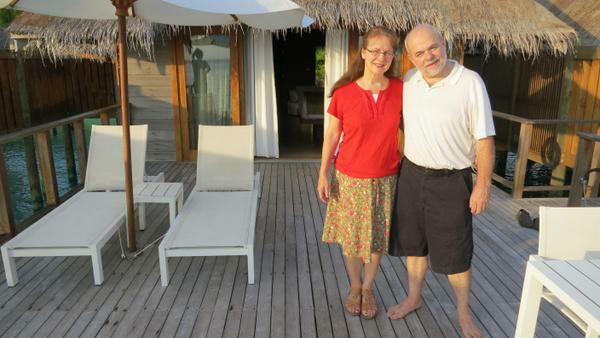 The overwater bungalow made for an unforgettable, once-in-a-lifetime experience, and we are happy we booked it for our parents. 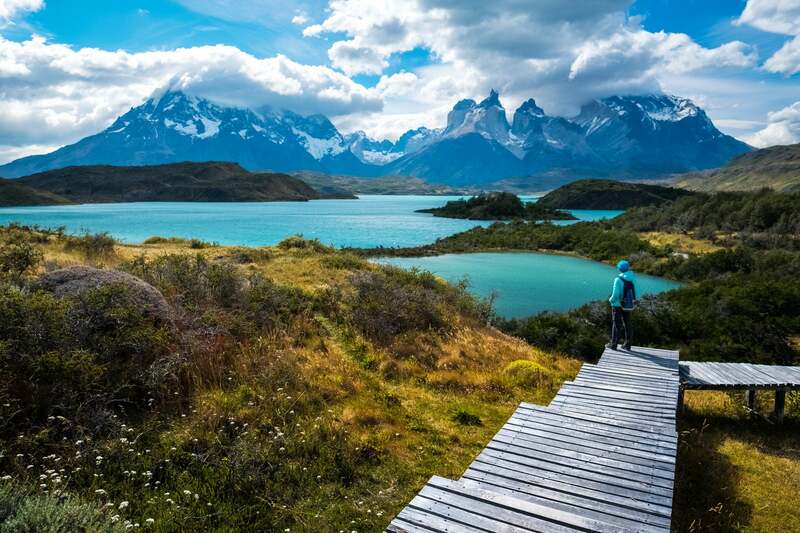 We hope we can go back one day! Thanks for putting together this report. 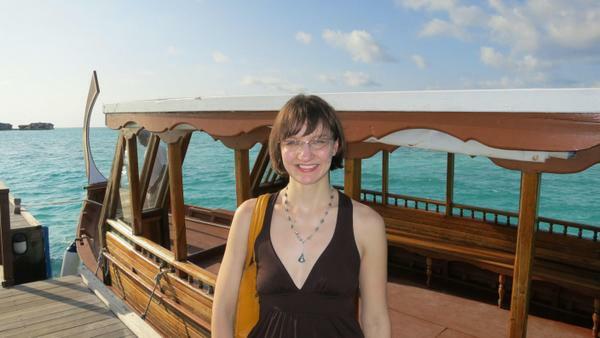 I used your Bora Bora report as my main guide for an 11 night stay last year, and now I am planning on going to the Conrad Maldives in ~July 2016. 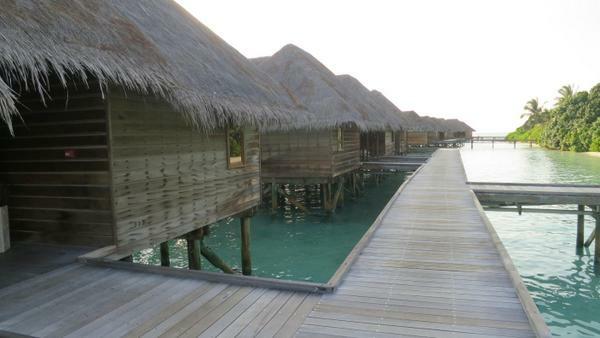 I’m curious if, like Bora Bora, you cased the overwater villas and determined which had the best views & or most privacy? I like the way your dad kicked off his shoes the minute he arrived in his room. Go dad!